Trying to go beyond debates between pragmatism and utopia, the conference calls for criticism and reflects on the ambiguous area where the concepts of utopian pragmatism and pragmatic utopianism cross. To do so, three main topics have been defined: What position can today’s architect adopt and how have others done it before? What are their methods? What are the new formats in architecture? Criticall invites all scholars to submit their abstracts on the respective topics until November 15, 2013 with a chance of presenting them at the conference. For more information, please, visit their website criticall.es. The deadline for the full paper will be March 14, 2014. 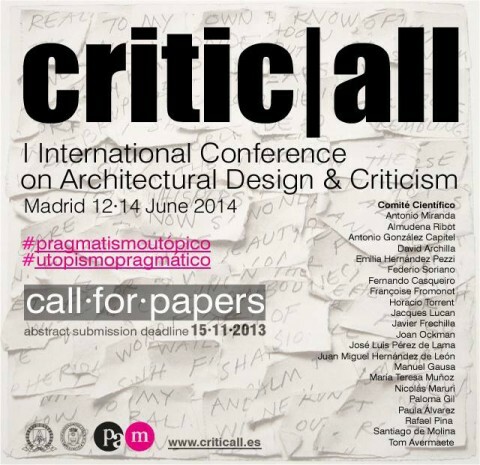 To register for the 1st International Conference on Architectural Design & Criticism with an early-bird ticket visit criticall.es before 3 Feburary, 2014.